There is a general perception in the arena of international relations that if countries with tensed relations pursue useful trade between them that could help reduce tensions. Some counties have tried this formula but not much has been achieved and tensions resurface. India and Pakistan, under pressure from USA, attempt this approach to mend ways and become friends. But, so far no progress has been forthcoming manly because their tensions are of their own making, directly linked to their joint occupation of Jammu Kashmir, a soverign nation in South Asia until 1947 when both of them invaded that heaven on earth lying as sandwich between them where prophets lived and passed away. Jammu Kashmir is now under the control of India, Pakistan and China. Unlike other countries with tensions, India and Pakistan have a tough task at hands: they find it very difficult to solve the problems and resume better bilateral relations because in order enter a new era of fretful relations both India and Pakistan have to quit Jammu Kashmir. New Delhi accuses Islamabad of having a hand in the audacious attack. Denying the charge, Pakistan itself criticizes India’s repression of pro-independence protests in the disputed Himalayan region of Kashmir that began last July, in which more than 100 Kashmiri civilians have been shot dead by Indian forces and thousands more injured. In fact, the relations between the two South Asian nuclear-armed countries of India and Pakistan have been frosty for over six months. Their troops have engaged in heavy firing along their borders, targeting both civilians and military establishments and resulting in scores of deaths and injuries. In Indian-administered Kashmir, people began protesting after the killing of a young militant commander, Burhan Wani, of Hizbul Mujahideen (HM), which calls for the secession of Kashmir from the Hindu-majority nation and its merger with the Muslim nation of Pakistan. Tensions escalated into attacks on Indian army facilities by militants, which India blamed on Pakistan. Without resolving the explosive Kashmir issue, trade between India and Pakistan cannot help -and has not helped – improve the ties between the South Asia‘s nuclear powers. In fact, growing diplomatic tensions coupled with frequent border clashes since last year’s militant attack on an army base in Jammu Kashmir have further shrunk the already meagre trade between India and Pakistan. Pakistan’s major exports to India include leather goods, dried fruits, especially dates, surgical instruments, zinc, and oil seeds, while it imports cotton, organic chemicals, plastic, dried vegetables, artificial fibers, tires, faux jewelry, and woven fabrics. Currently only 21 trade items of goods have been approved for trade between the two parts of Kashmir. Based on the prices of goods being provided by the traders, in the three years up to the end of the 2015-16 fiscal year, commodities worth near 15 billion Indian rupees ($220 million) were exported to Pakistan on the Uri-Muzaffarabad and Poonch-Rawalkote routes. Imports of nearly Rs 13 billion ($190 million) were made during the same period. That’s up from 2011-12, when exports to Pakistan-administered Kashmir (PAK) were worth Rs 3.2 billion ($44 million), while imports were at Rs 5.31 billion ($78 billion). Mounting hostilities have virtually shattered the dream of boosting the trade volume between the two nuclear-armed neighbours from the current $2.5 billion to $6 billion over the next two years as businessmen from both sides see no immediate signs of a thaw in ongoing tensions. The bilateral trade has never been strong. There is already a 20 percent decrease in trade between the two sides, and it is likely to further decline in the months to come if the ongoing tensions are not stemmed. But India has complicated it by denying visas to Pakistani businessmen since last September, which is affecting the bilateral trade dynamics. Bilateral trade takes place first between both sides of Kashmir and later between India and Pakistan as a long term consequence. 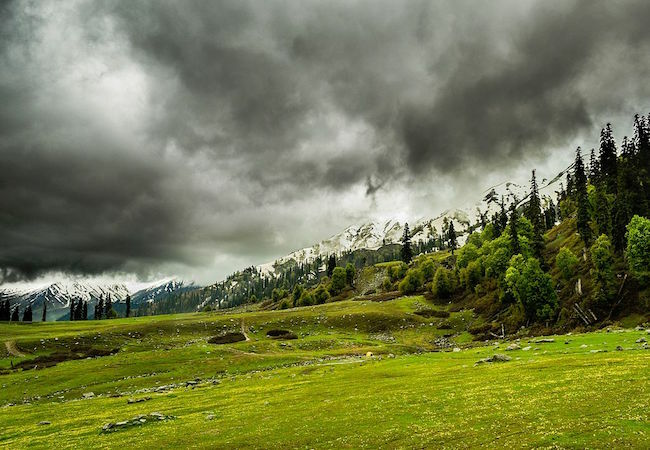 Azad Kashmir and Indian side Kashmir serve as a trade corridor between India and Pakistan. True, Pakistani or Azad Kashmiri products are not available in Indian shops. Indian government does not want any Indian to consume the products produced by them while India does not object to use of Chinese goods by Indians, though India and China are not even in talking terms. China sells cheap products in India. In 1996 India gave most-favourite nation (MFN) status to Pakistan, but this was not reciprocated, mainly due to opposition from Pakistani stakeholders, especially agriculturalists, fearing that a bigger Indian market could engulf their far smaller one. Meanwhile, India’s counterterror agency, the National Investigation Agency, is investigating whether the traders from Kashmir have been providing money raised through the exchange of goods to separatist political parties, which are seeking merger of the Indian state of Jammu and Kashmir with Pakistan. The NIA has seized the records of over 350 traders from Kashmir to investigate whether any money makes it to separatists. Kashmir government officials have also sought the balance sheets of their trade transactions and the details of bank accounts from the traders, looking for any violation of legal procedures. Since a brazen attack last September near the town of Uri, in Jammu Kashmir, killing 19 Indian soldiers, the two sides have been engaged in frequent border clashes that have claimed over 60 lives on both sides, civilians and soldiers alike. Last September’s attack led to Indian Prime Minister Narendra Modi claiming that Indian forces carried out surgical strikes in the Pakistan administered Kashmir (Pak) killing several “militants”. Yet, despite frequent cross-border skirmishes, cross-LoC trade between both sides of Jammu Kashmir goes on. However, the hostilities between the two neighbors have ensured that there are no banking facilities to turn the barter trade, which started in October 2008, into a regular currency trade. The provincial government in India occupied Jammu Kashmir is ruled by CM Mehbooba Mufti and controlled by PDP and BJP has asked Indian PM Narendra Modi of the BJP for the barter system to be replaced with formal currency trade. In April last year, Mufti issued instructions to officers to work out the modalities for establishing banking facilities in order to begin trade in currency after approval was given by the Reserve Bank of India. But just as Mufti’s government was looking to take up the matter with the authorities of Pakistan-administered Kashmir, the Indian part of Kashmir erupted in protests that continue even now. In 2008, India and Pakistan had taken the step of running trucks on routes that connect the two parts of Kashmir, the Srinagar-Muzaffarabad and Poonch-Rawalakot roads. The opening to trade was seen as the biggest confidence-building measure since the two countries fought their first war over Kashmir in 1947 when both obtained sovereignty. The decision to start trade across the LoC was taken in the follow-up of a meeting between the Indian prime minister and the president of Pakistan in April 2005. Indian and Pakistani officials held talks at Indian capital of New Delhi in May 2006, in which it was decided that cross-LoC would be started through a truck service, for which a list of goods would also be identified. Subsequently in a meeting between the Indian government’s Ministry of Home Affairs officials and the provincial government officials in Kashmir held on June 16, 2008, it was decided to develop the facilities in two places, at Uri and Poonch, to start the trade. After identifying land and creating other facilities, cross-LoC trade formally started between two countries in October 2008. Trade has remained particularly low in the last six months. Trade remained suspended on the Uri-Muzaffarabad road until September 28, nearly 87 days, due to the shutdown in Kashmir, preventing any vehicular movement. Along the cross-LoC trade route, frequent exchanges of heavy mortar fire between Indian and Pakistani troops are witnessed. Intermittent firing has been reported across the LoC, which was delineated by India and Pakistan after the 1971 war and replaced an earlier ceasefire line. However, Hussain continued, “Immediately after the agreement India asked United Nations that there was no need for the Observer Mission, which was to monitor the ceasefire line. The UN Observer Mission existed in Srinagar, Delhi, Rawalpindi, and Muzaffarabad, deployment of the Mission being decided by the Security Council. Though the Observer Mission is in Sri Nagar but India is not cooperating as it wants to assume that. For one thing, Pakistan insists that the LoC is not an international border, so the trade along the line can’t be conducted as international trade. But the legal status of the LoC would remain “unchanged if basic facilities like banking are provided to traders.” The uncertainty impacts the trade environment. Like its secret ally congress party, the Hindu-nationalist party BJP-led government at the center in New Delhi was shying away from starting a dialogue on Kashmir. Kashmiri freedom fighters have been arguing that Prime Minister Narendra Modi should follow the policy of former prime minister, A. B. Vajpayee, who took the initiative to extend the hand of friendship to Pakistan and visited Lahore in February 1999 to de-escalate tensions. During his visit Vajpayee had said that India was serious about establishing “friendly” ties with Pakistan. Today, however, there is still no indication that the two countries will resume dialogue. The entire regional diplomacy is in reverse gear; there is no formal, structured dialogue process happening. The trade can’t be isolated from larger India-Pakistan bilateral process. Recently, ties between India and Pakistan have gotten even worse. Unwilling to openly admit its crimes in Kashmir, India quickly blames Pakistan both for the civilian protests and for a militant attack at an army base in Uri in Kashmir. In response, India claimed to have conducted cross-LoC “surgical strikes” in Pakistan. The chain of events has left the relations between India and Pakistan at their worst in recent memory. Senior Kashmir government official Farooq Ahmad Shah said that on average the trade between two parts of Kashmir is worth over Rs 30 million ($440,000) per day: “On average we are allowing 40-50 trucks each day, four days a week from both the sides.” He said that the need for banking facilities has been brought to the notice of the higher authorities. A senior official who monitors the trade at the Poonch-Rawalkote cross-LoC point, said that every day about 30 trucks are allowed to travel from Indian-administered Kashmir to the other side, while nine trucks from PAK also carry goods in the other direction. Due to the lack of banking facilities, cross-LoC traders often confront debt-related disputes. A trader from Srinagar, Hilal Ahmad, who has been in the trade since 2008, noted that there were difficulties in carrying out the trade. Due to the barter system, money remains often held up with the traders from other side but there is no mechanism to resolve these disputes. It runs only on trust. The lack of telephone facilities was further compounding the problems of traders. “We can’t call up the traders on the other side of the LoC, but they can call us, which is only making the running of trade difficult. There is only telephone facility is at the office of the Custodian Cross-LoC trade in Uri and the Deputy Commissioner Baramulla office, which are several kilometers away from Srinagar. Earlier, the provincial government in Kashmir had decided to take up the matter of issuing multiple visit permits to the drivers with the central government in New Delhi, but due to the recent India-Pakistan hostilities the matter has remained held up. A multiple visit permit would have ensured that the drivers could go to the other side of the LoC many times on a single permit. A senior Kashmir government official said that as of now the concerned police authorities issue permits to the drivers to travel to the other side of LoC, which must be renewed before every visit. In addition, plans to set up full-body truck scanners at Uri and Poonch, which would have replaced the manual checking of goods and helped increase the volume of trade, were scrapped due to the tensions between the two countries. Trade custodian Shah said that it was the “prerogative” of the Indian government to set up the scanner and to issue the multiple permits for the drivers who ferry items to the other side of the LoC. There are hardly any other instances in the South Asian region of trade being run on the barter system. Today’s world trade is regulated by WTO regime without any provision of barter trade between the countries under the WTO regulations. LoC trade is more or less symbolic in nature and in the process there are some economic misgivings… Initially only almonds and three to four other items were traded. It is not a huge trade. Though the Reserve Bank of India (RBI) cleared the proposal of the Jammu and Kashmir Bank to open a branch in Muzaffarabad in Pakistani Azad Kashmir, that was however not cleared by Pakistan. India and Pakistan must think something new, may be out of box. The artificial LOC should be dismantled and removed for ever first by establishing soft borders and eventually remaking Jammu Kashmir as it existed until 1947- the memorable year when India and Pakistan became free from British occupation and Jammu Kashmir came to be occupied by Indo-Pakistan. The LoC was the outcome of Simla agreement between Indian Prime Minister Indira Gandhi and Pakistan’s President Zulfikar Ali Bhutto. Both Gandhi and Bhutto pledged to honor the LoC, but the division has long been plagued by violence. For now, then, cross-LoC traders continue to exchange goods the old-fashioned way – and under the radar of a long-simmering conflict. Given the circumstances between India and Pakistan, it is not surprising that strengthening cross-LoC trade has not remained a priority for both nations. The 2003 ceasefire between India and Pakistan has been flagrantly violated, due to which the cross LoC trade has taken a backstage seat. There shouldn’t have been any problem in expanding the trade. It was a big confidence-building measure which couldn’t be carried forward. Starting the LoC trade itself signified that Kashmir remained an unresolved dispute. The LoC across which the trade is taking place is not an international border. It was due to this that India and Pakistan agreed that no passports are required for travel and trade… The travel is allowed on local documents and the trade was also started in a manner keeping in view the sensitivities of India and Pakistan. Despite the current tensions, the trade has not stopped, which is a positive indication. Otherwise the ceasefire is gone after the surgical strikes. There is frequent exchange of heavy gunfire along the border. Trade between neighboring nations is of paramount importance. But, for India and Pakistan, trade could be fruitful and beneficial only in normal course and only after the Kashmir allowed sovereignty and freedom by these nations.